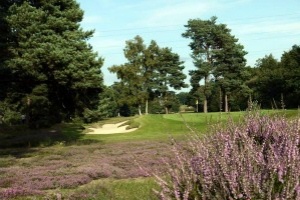 The Southern Counties Heathland Golf Tour includes the two best courses in Hampshire, the best course in West Sussex and two classic Surrey heathland golf courses. You can experience miles of unspoilt heathland undulating across the three counties, and play some extremely challenging golf along the way. Despite being only an hour from London, the experience of playing the Southern Counties Heathland Golf Tour is one of escape to a very special part of the world, that appears to have been untouched for years. West Sussex was founded by Commander George Hillyard, who thought the sandy farmland at Wiggonholt near Pulborough, would make for an idyllic, natural course. Designed by renowned golf course architects, Campbell and Hutchinson, the layout was opened in 1930 and remains pretty much the same as it was back then apart from the prolific growth of trees – mainly pine and birch – that were planted in the 1930s at the time of construction. 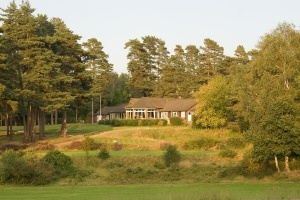 Liphook’s inland heathland course was designed in 1922 by Arthur Croome and completed by his partner Tom Simpson after Croome’s early death. Measuring 6,295 yards from the Championship tees, the par 70 layout rewards golfers applying course strategy rather than big hitting. Its tight fairways linked with an abundance of heather, gorse and trees require accuracy off the tee. However its greatest defence is its greens, true and fast with subtle breaks and borrows, that make it a wonderful test of golf. Established in 1913 and designed by the famous golf course architect, Harry Colt, Blackmoor has matured into one of Hampshire’s more revered tracks. 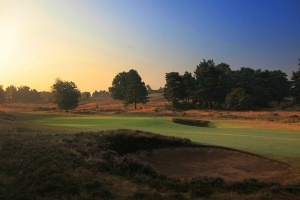 This par 69, 6,164 yard is a traditional heathland gem with fairways bordered by oak, pine and birch trees. The course features par 3s that all possess the Harry Colt stamp of elevated greens that are well protected by bunkers and numerous subtle doglegs that demand accurate driving. Testament to the quality of the course, Blackmoor played host to regional qualifying events for The Open Championship between 1998 and 2013. Founded in 1904 by the writer, Sir Arthur Conan Doyle, and a small group of fellow golfing enthusiasts, Hindhead nestles in one of the most glorious natural settings in the southern counties. 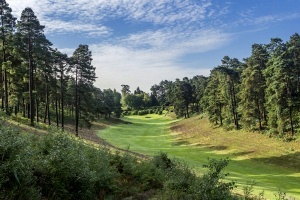 The Devil’s Punchbowl is a large hollow of dry sandy heath to the east of Hindhead and holes two to nine are laid out through this same heather strewn Ice Age valleys, making the front nine the most dramatic. 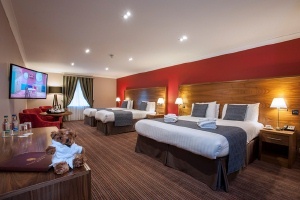 The back nine is a fine golfing challenge laid out on the overlooking heathland plateau. 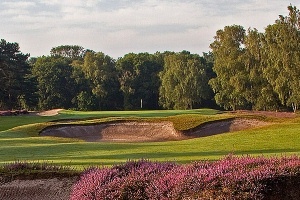 Regularly ranked amongst the best of England’s heathland courses, the J.H. Taylor designed par 70 layout measures 6,390 yards..
Hankley Common first opened for play in 1897 over just nine holes, then in 1922 the famed course designer, James Braid, advised on the addition of a further nine holes. It has been receiving plaudits ever since: Bobby Locke described it as “the closest resemblance to a seaside links” and the famous course architect, Charles Lawrie, once described the course as "one of the best inland layouts in Britain". The 7th hole is regarded as one of the finest par 3s in the country and the magnificent 18th a superb, but challenging finishing hole. The course and surrounding area are classified as a ‘Site of Special Scientific Interest' which includes a number of indigenous trees such as rowan, oak and silver birch, together with the invading Scots pine.